Making the move to community living is an exciting transition filled with discovery and engaging activities for older adults. Hopefully, your new community will provide you with the opportunity to interact with welcoming neighbors, and engage in activities you’ll enjoy. Depending on your circumstances, you may be moving to a condominium development or retirement living community. Living in a community has many benefits, as CTV News explained, such as freedom from chores like mowing the grass and shoveling snow. You can look forward to neighbors with similar interests and lots of opportunities to have fun. Preparing for this journey is important and it helps to plan ahead. Moving can be stressful, no matter when it occurs. Begin planning for your moving day early to ensure a smooth and seamless transition. Packing in advance and hiring help will enable you to feel calm during your move. If you are downsizing, look at your belongings and decide what to keep and what to donate or dispose of. You may find this process of simplifying more fulfilling then you expected it to be. Be a good neighbor: In a community living arrangement, you are sharing space with your neighbors. 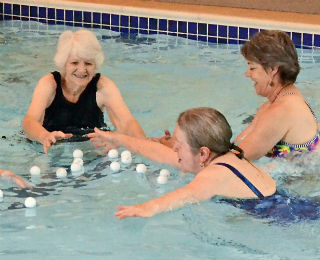 Building friendly relationships with your fellow residents is one of the greatest benefits of community living. Being committing to living in cooperation and consideration of your neighbors is also a vital part of easily transitioning to community living. In some cases, you may be sharing walls and community spaces with neighbors. Be considerate of others and help to keep those shared spaces orderly for everyone to enjoy. Although many older adults are drawn to community living by a low-maintenance home, according to Forbes.com, some shared spaces are kept up by residents. Check with the staff or the resident association to see how you can help care for the indoor and outdoor space surrounding your new living space. Healthy friendships are built on a mutual respect for the each other’s privacy. Socialize with fellow community members: You will meet new friends who can provide valuable camaraderie and companionship. During your first days and weeks living in your new home, socialize with fellow community members by attending events, spending time in common areas, and signing up for activities and classes. Get involved: Your new community may offer opportunities for learning and personal growth. Commit to living a healthy and adventurous life as an older adult. Sign up for classes that peak your interest, whether it is in art, music, history, education, and get involved in activities, events, or field trips that spark your curiosity. Consider volunteering or joining a fitness class. Get to know the staff: The staff can also help you adapt as an active member of your new community, explains Sarah Jennings of A Satisfying Retirement. Make an effort to connect with staff during your first few days. They can provide information about services available and help connect you with the activities available to you. Stay connected: As you transition into your new home, remember to keep in touch with your friends and family. The relationships you have will play a strong role in supporting you during your move. And invite them to visit after you’ve settled in. They may like what they see and consider joining you! A move into a community living environment may be different than what you're used to, but it can be a rewarding opportunity. By following the tips provided above, you will thrive as you comfortably transition into community living.